“Nobody can make Koraishutir Kochuri as good as…” my father said and paused! I was witnessing this cat fight between my loving parents along with my daughter who was busy having some homemade chocolate. What I understand from that fight was I haven’t asked Baba to come to my place to have his favorite Koraishutir Kochuri along with Natun Aloor Dum this year yet! Without delaying further, I made typical traditional Bengali Koraishutir Kochuri last week for him and we had it too! I have noticed a few variations of the Koraishutir Kochuri’s stuffing by different people within and outside my family. In my place, a paste of fresh peas is used to make the stuffing. However, Chordibhai prefers to boil Koraishuti for making the stuffing. Both my Maa and Jethima do not like to add Hing (Asafoetida) or Bhaja Masala (dry roasted Cumin and chili powder) while making the stuffing while Both Boro Pishi and Choto Pishi (my paternal aunties) used to add these two in their version. One of my Friend’s mother used to mix whole wheat flour with all-purpose flour while making the dough. Maa-in-law uses only whole wheat flour to make the dough for Koraishutir Kochuri and my Mom’s version is prepared with all-purpose flour! Confusing isn’t it! After tasted lots of variation of a single item; I decided to have my own version which is influenced by all of them. Baba thinks my version is close to Koraishutir Kochuri prepared by his mother i.e. my Thakuma. I made it last week (like every winter) especially for Baba following my recipe. Baba was extremely happy with both Koraishutir Kochuri and Natun Aloor Dum that I prepared for him and he was remembering his days with his mother and his loving daughter decided to write the recipe of Koraishutir Kochuri for the readers of this Bengali food blog Debjanir Rannaghar. I was planning to write a detailed post about Koraishutir Kochuri or Matarshutir Kachuri since long and it was not happening for weird reasons. I have deleted pictures two times given I was not happy with the clicks. When I posted Natun Aloor Dum here in Debjanir Rannaghar a few days back I finally decided to make this happen as early as possible to give my Aloor Dum his perfect companion of winter Koraishutir Kochuri. Koraishuti or Motorshuti is the Bengali name of fresh Peas and Koraishutir Kochuri aka Bengali Matar Kachauri is a popular winter delicacy. 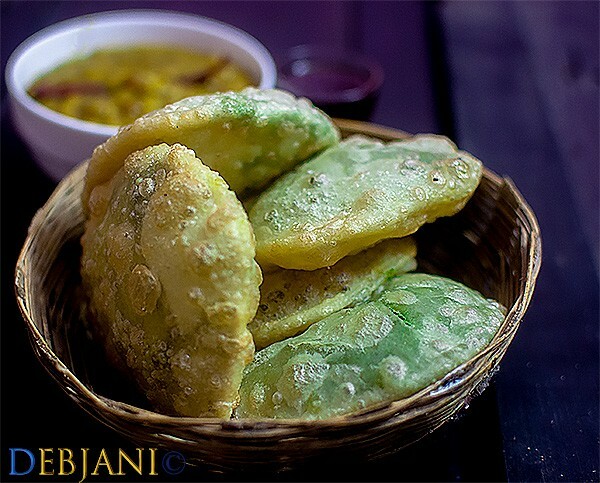 We bongs have a special place in our heart for the green peas stuffed fried flatbread. A Bengali wedding dinner or any special Bengali dinner happening in the winter session is almost incomplete without this. Though can be prepared with packaged Peas at any time of the year but having Koraishutir Kochuri prepared with the fresh peas is something nothing but heavenly. 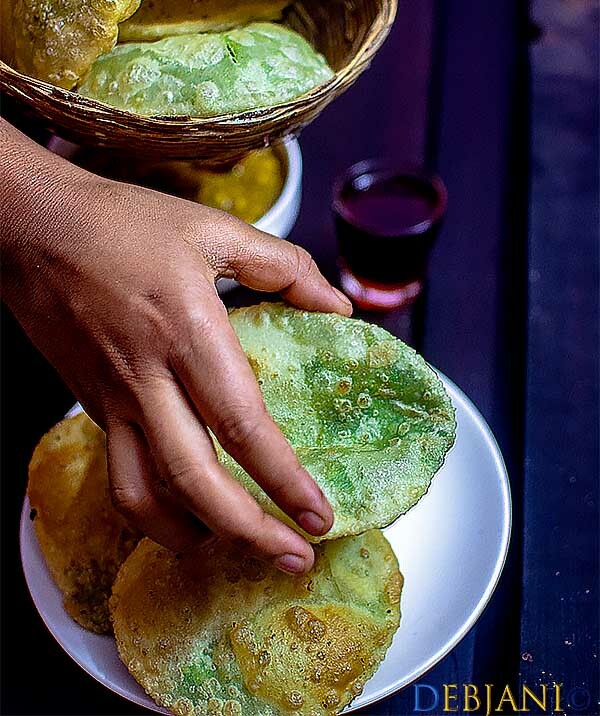 Though a famous Bengali food but this no onion no garlic Koraishutir Kochuri or Matar Kachauri can be tried by anybody who loves fried flatbread. Almost every bong tries to make it at least once during the winter and if not living with the elders it is sometimes considered a bit messy to prepare it. 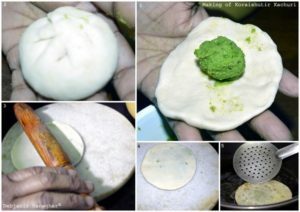 I have tried to capture each and every step of making the Kachauri so that this can be prepared easily to celebrate winter in a Bong way. Here’s how I make Koraishutir Kochuri at Debjanir Rannaghar! 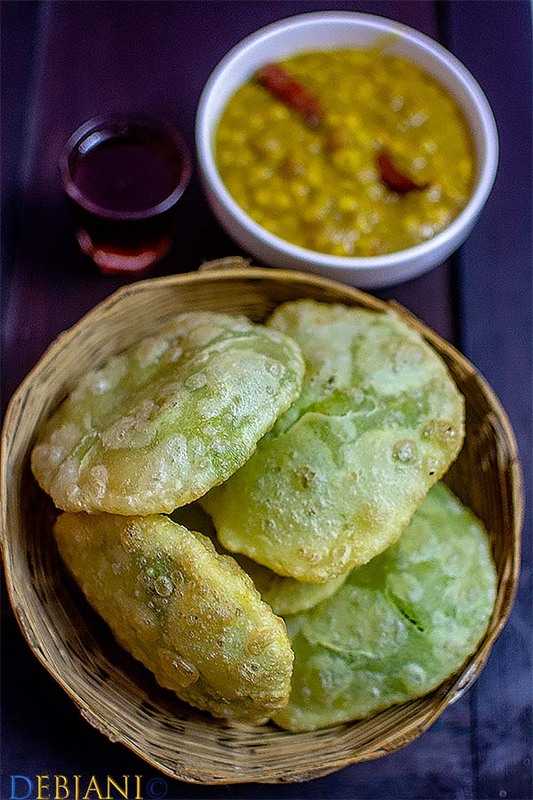 Koraishuti or Matarshuti is the Bengali name of fresh Peas and Kachuri stuffed with Koraishuti is a popular Bengali winter food. Asafoetida / Hing: ¼ Tsp. Dry roast Cumin seed, Carom Seed and Dried Red Chili for 1-2 minutes in low flame on a non-stick pan. Let the spices cool completely. Make a coarse powder of the roasted spices and use the Bhaja Masala in making the stuffing. 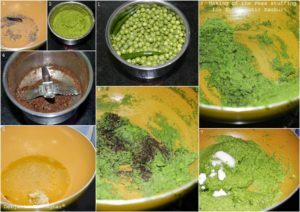 Make a smooth paste of Green Peas using either a mixer grinder or using a traditional Shill Batta or Shil Nora along with the Green Chilies. Heat Oil in a pan (preferably non-stick) and temper the oil with asafoetida and ginger paste and cook for 1 minute in low flame. Add the peas paste to it. and start cooking in medium flame till the raw aroma of peas gone completely. Add 1 Tsp. of Bhaja Masala Powder, Salt, and Sugar to the mixture and give the stuffing a mix. Cook for few more minutes till the mixture leaves the edges of the pan and switch the flame off. Keep 2 Cup full of water handy for making the dough. Take both the flour along with salt and using a sieve shift it once. Add Oil to the flour mixture and using your hand mix it to turn into a crumbly mixture. Now add ½ a cup of water to the flour mixture. Keep needing and add water as required. It took me 1 Cup and 3-4 Tbsp. of water to make not so tight dough. Cover the dough with a piece of wet cloth for 10 minutes. Divide the dough into around 20 equal portions. Make ping pong ball sized dough ball from the dough. Flatten a dough ball as shown in the picture in your hand or on the kitchen top. Place 1 spoon full of stuffing in the middle and seal the flattened dough to make a stuffed ball. Following this make rest of the stuffed dough balls. Now heat sufficient oil in a wok to fry Kachories. Take a rolling pin and roll out each stuffed balls into a disk of 4-5’’. Thi to be done without making a hole in the body of the flattened disk. If required sprinkle little oil on the roiling board before rolling the dough. Fry from both the side on medium flame. While frying press little with a perforated ladle to help the Kochuri puffed properly. Following this deep fry rest of the Kochuri. Serve Koraishutir Kochuri with Natun Aloor Dum and Nolen Gur! Instead of fresh green peas; packed one can be used. adjust Spices especially chili as per your taste. 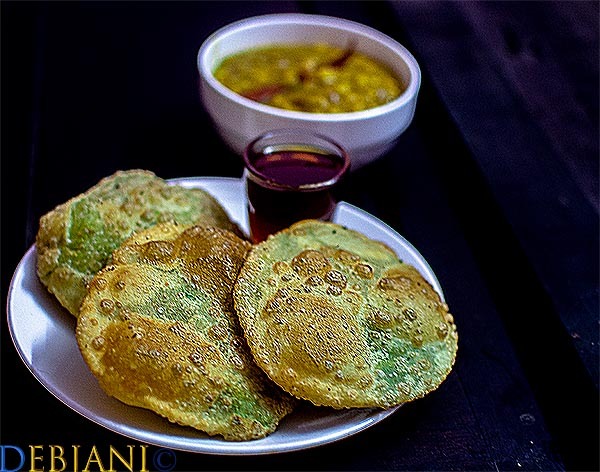 Bengali Sidedish recipes (to serve with Koraishutir Kochuri) from Debjanir Rannaghar! 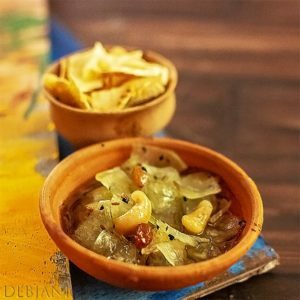 Have you tried the Koraishutir Kochuri recipe from Debjanir Rannaghar!